Expanding El Rey’s slate of adrenaline charged event programming, “Bushido Battleground” combines documentary with fights that are 100% real. Each episode is a multifaceted sporting event filmed at locations around the world including Thailand, Mexico, Canada and Los Angeles. The first episode, “Rumble at the Border,” debuts October 18th at 10:00pm and features MMA Fighters Chris “Taco” Padilla and Ivan “Choko” Castillo who square off in a match at the historic Plaza De Toros Bullfight Arena in Tijuana, Mexico. “Bushido Battleground” is hosted by former NFL safety Tony Parrish and former mixed martial artist Nate Quarry. Executive producers of “Bushido Battleground” are George Chung and Andy Horne. Chung is the CEO and co-founder of JUNGOTV and is a former five-time world martial arts champion and member of the Black Belt Hall of Fame. Horne was co-producer on “Blade” and “Blade II” and developed “La Femme Nikita” and the animated series “Spawn”. Martial artist and actor Michael Jai White (Spawn) will narrate El Rey Network’s “Bushido Battleground,” the new, twenty-episode series showcasing elite fighters from around the world in Mixed Martial Arts, submission Jiu Jitsu, full contact Kick Boxing and Muay Thai. The series will debut on Wednesday October 18th at 10:00pm ET. 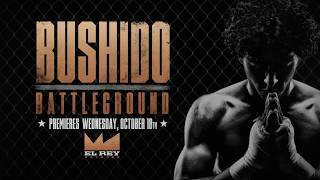 (AUSTIN, October 12, 2017) – El Rey Network’s “Bushido Battleground,” the new, twenty-episode one-hour series showcasing elite fighters from around the world in Mixed Martial Arts, submission Jiu Jitsu, full contact Kick Boxing and Muay Thai will debut on October 18th at 10:00pm ET. The premiere episode airs immediately following the season 3 finale of “Lucha Underground.” “Bushido Battleground” is hosted by former NFL safety Tony Parrish and former mixed martial artist Nate Quarry. Expanding El Rey’s slate of adrenaline charged event programming, “Bushido Battleground” combines documentary with fights that are 100% real. Each episode is a multifaceted sporting event filmed at locations around the world including Thailand, Mexico, Canada and Los Angeles. The first episode features MMA Fighters Chris “Taco” Padilla and Ivan “Choco” Castillo in a match at the historic Plaza De Toros Bullfight Arena in Tijuana, Mexico. The second episode features Muay Thai fighters “Tu” Warren Stavone and Janerob Pumpanuang at the world-famous Max Muay Thai Stadium in Pattya, Thailand. Tony Parrish is a former American football safety that played nine seasons in the National Football League. He was drafted by the Chicago Bears in the second round of the 1998 NFL Draft with the 35th overall pick. He played college football at the University of Washington. He was an Associated Press All-Pro in 2003, and is listed on the 49ers' All-2000s team. Parrish was also a member of the San Francisco 49ers, Dallas Cowboys, and Las Vegas Locomotives. Executive producers of “Bushido Battleground” are George Chung and Andy Horne. Chung is the CEO and co-founder of JUNGOTV and is a former five-time world martial arts champion and member of the Black Belt Hall of Fame. Horne was co-producer on “Blade” and “Blade II” and developed “La Femme Nikita” and the animated series “Spawn”.